It was only the early 1970s that the first backpackers traveling on a coconut boat arrived on Koh Samui. For years after the island just had a few bungalows and a trickle of travelers. In the early 1990s, boats full of tourists started arriving, and since then the island has soared in popularity. Koh Samui is now the most popular island destination in Thailand and it is an oasis of natural beauty, with its white sandy beaches, dazzling corals, luscious lagoons, picturesque waterfalls, swaying coconut trees and crystal clear water. Tourism is now ahead of coconuts as the islands main industry. Samui is visited mostly by holidaymakers wanting to ‘get away from it all’, and its main appeal is its funky rural beach communities with white beaches and clear & warm seas, and it has a few exceptional ones to choose from. Koh Samui is hardly ‘away from it all’ anymore, but rather a cool and bustling international island resort. Chaweng Beach covers a large portion of the island’s northeast coast, and is easily the most crowded and tourist saturated region on the island. The beach is beautiful and clean with fine white sand. Several hotels, ranging from budget resorts to luxury properties for rent in Samui line up the shore. Restaurants are set right along the beachside, making Chaweng Beach seem to glow from within the sands. Set back about 100 meters from the sand, the one way beach road in Chaweng has developed into a bustling international tourist town packed with every kind of resorts, restaurants, and bars (ranging from busy traditional family-run open air seafood and noodle stalls, through exclusive Thai-Californian fusion food to Irish Pubs and American Fast Food places like McDonald’s and Starbucks), Fine art, tailors, and souvenir shops, markets and wild, rambunctious, or chilled out nightclubs. Also on the East coast is Lamai, just south of Chaweng and smaller and so Lamai’s beaches are less crowded than Chaweng. Lamai was the original destination for travelers to Samui, and compared to Chaweng the town is a bit more tawdry and low budget, but it has its own distinct charms. Greater Lamai is actually a large and beautiful valley, and as one travels inland away from the beach village the landscape is striking. Lamai has some pretty outrageous ‘social’ bars in the middle of town, and the once a week all girl Muay Thai boxing matches always seem to draw an eclectic crowd. In the center of the North coast of the island, Maenam offers spectacular views of Koh Phangan to the North, and the Ang Thong National Marine Park to the East. The waters are calm and clean, being protected from the North Easterly currents by Koh Phangan. Because the sand is golden rather than white, Meanam is usually much less crowded than Lamai or Chaweng, and Maenam’s restaurants and bars still retain much of the local Thai flavor as well as being more reasonably priced, or even inexpensive. Overall Maenam is quieter, more relaxed, with local Thai community still pretty much intact. One of the two major golf courses on the island is also in Maenam. Bophut is the beach/bay just to the east of Maenam. Its lifestyle is relaxed and more traditional than the larger communities, referring to itself as Fisherman’s Village. Bophut’s laid back vibe is popular with the more chic sort of travelers, and has a number of pricey but very good French-owned cafes and restaurants. Bang Rak, just two kilometers east of Bhophut, and part of Bophut ‘province’ is also known by the name Big Buddha Beach, after the 19-metre gold tinted statue of the ancient spiritual master which overlooks the entire bay (Big Buddha). 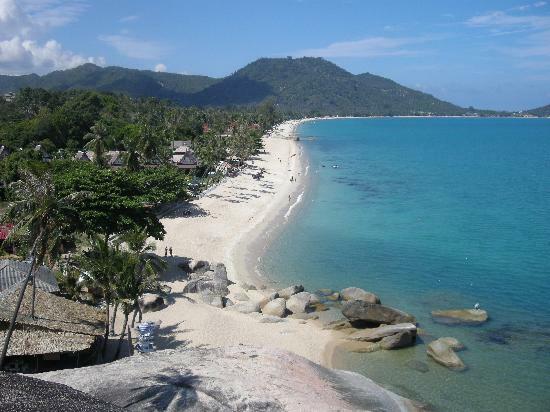 Bang Rak is quite close to the airport, and is one of the calmest beaches with its jade colored waters. Bang Rak is the jump off point to sister island Koh Phan Ngan, and the ferry goes every day. Choeng Mon is one of the smallest of Samui’s tourist beaches and lies in a secluded bay on the northeastern tip of the island, making it perfect for those who want peace and quiet. It doesn’t have much of a town but there are a number of small restaurants and a couple of shops, in addition to some very luxurious (and expensive) hotels that surround the bay…and it is only five minutes north from the bright lights of Chaweng. Ao Tong Takian is a small cove north of Lamai beach. 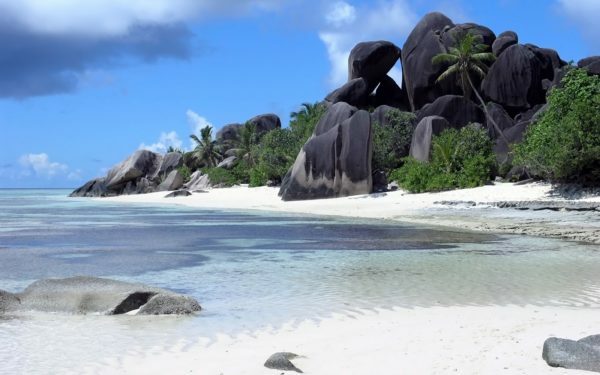 It’s long been popular among hip tourists for its inviting white sand, and is also known as Silver Beach. This used to be a relatively unknown spot. There is great swimming here if the local fishing boats are not around. Nathon on the Southwestern coast is the island’s main port and the beaches here lack the beauty found on the east coast of the island. The city of Nathon offers great shopping with some of the best prices to be found anywhere on the island, as well as some truly good local restaurants, including a fantastic place on a side street where you can get a low priced Chinese Duck lunch. The open-air food market is piled high with inexpensive and fresh local produce. Some of the shops in Nathon are really offbeat, selling umbrellas, computer parts, stationary, and cheese in a single shop. Banks and Travel agencies here make it happen for travelers, and the ferry to the mainland and point beyond departs from this port. Lipa Noi’s wide sweep of sand is the last quiet place on the island. Lipa Noi faces due west and looks directly into the stunning Thai sunsets. It won’t last long, but this is the part of the island where you can still feel like you are free from the tourist circus. It’s really romantic, and there is not much to do. Tong Krut on the South West corner of the island is currently one of the quieter areas of Koh Samui and is being proposed as the site for the islands future mega-yacht harbor.